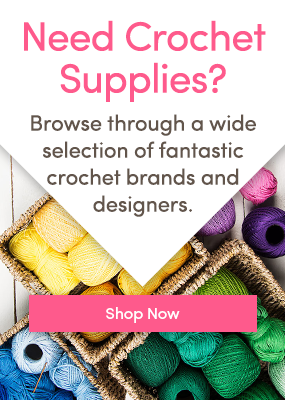 Crochet Club: FREE pattern and book giveaway from Ruby & Custard! It’s Indie June, and we’re celebrating our independent designers all month long. This week, Melissa Masterton from Ruby & Custard introduces her fabulous new book – and we’ve got three copies to give away! Meet Millie Masterton, author of the Ruby & Custard blog, and fabulous new book Ruby & Custard’s Crochet: Creative crochet projects to make, share and love! Can you tell us how you got started with Ruby & Custard? About five years ago I spotted a beautiful but expensive crochet cushion cover in an exclusive homewares shop. I was always a knitter but I just thought to myself “it can’t be that difficult!” So, with the help of a book and some YouTube tutorials I taught myself to crochet and utterly fell in love with it – in fact I haven’t actually picked up a set of knitting needles since! I love crochet because of the flexibility in design that I don’t think you get with knitting. It’s so much fun to come up with beautiful accessories, home furnishings and decorations! Ruby & Custard was born out of a desire to share my love of crochet with others. The name came about because I wanted something that reflected the fun and playful nature of the things I like to create. We love your royal patterns! Where does your inspiration come from? There is quite a big London and royal theme running through my designs – London buses, guardsman egg cosies, skyline cushions and even a crochet tiara! I commute to London’s West End every day and I love London’s landmarks and the sights and sounds of the City. I am so lucky to work close to St James’s Park and I never get bored of looking at the beauty of my surroundings. The free guardsman decoration pattern is based on the guards outside Buckingham Palace. I wrote a lot of the book on my train commute (much to the curiosity of my fellow commuters as I typed the patterns up as I went into my iPhone) and the London skyline cushion is directly inspired by the view from the train window. It has the Shard, St Paul’s cathedral, Tower Bridge and the London Eye – all in crochet! Your book is fantastic! How did you decide what to put in it? The book was so much fun to write! Ruby & Custard has quite a strong style – somebody once said it was The White Company meets Cath Kidston which I was very flattered by! It is a real mix of vintage style with a modern twist. I designed things that I would want to wear and have in my home – there’s no ‘granny’ style stuff in sight! I had a tough job trying to narrow down what to put in the book but I divided it up into chapters of hats and headwear, accessories, items for the home, gifts for babies and children and then Christmas to give me a structure. There are over 30 patterns in the book and the idea was that it could be used and loved all year round. I also hope that the patterns will inspire people to adapt them and create new items to love and share. The book is also very personal. My daughter is one of the models (she is the blonde one with one of her little friends) and the other models are children of my friends. Also, it was photographed in my home – if you look closely in the background of the London skyline cushion you can see a photo of my children and me! And yes, that is me modelling…but I really don’t like looking at photographs of me! Tell us about your crochet workshops! What’s next for Ruby & Custard? There are lots of exciting things coming up for Ruby & Custard. I am continuing to design crochet patterns and I have recently published several new free patterns on my blog including a little crochet crown applique, perfect for royal celebrations! So, watch this space! Download Ruby & Custard’s London Guardsman Soldier decoration FREE! Millie’s fabulous London Guardsman Soldier decoration is the perfect souvenir from a visit to London, or a darling gift for Christmas! Click the image above to download the FREE pattern! We’ve got THREE copies of Ruby & Custard’s Crochet book to give away! To win one, all you have to do is tell us which pattern you’d love to make from this blog post, and why! Add your answers in the comments section below: winners will be chosen on the 18th June and notified via email. Ruby and Custard’s Crochet: Creative crochet projects to make, share and love is published by Ebury Press and is available to buy on Amazon and in all good book shops. Buy it here! 64 Responses to Crochet Club: FREE pattern and book giveaway from Ruby & Custard! I would love to make the skyline cushion for my daughters to remind them of our trips to London. I would like to make the hat as I love it’s vintage yet modern look. The London skyline cushion is made CRAZY!!!! I LOVE to make that in blue and red. YEEESSSSS!!! have a Great Day. I would really like the hat. The flowery hat, so pretty. I would make the baby bunny blanket. Wanted to do one of these for ages! So cute. I would love to crochet the princess tiara headband for my little one. I would love to make the tiaras. My nieces would adore them! The egg coziest is so cute I would feel like I am having breakfast with the Queen. Simply marvelous with my grand baby enjoying with me. Wow I would love to make that flower beanie first, and the skyline cushion. I worked in London for a few months and used to love being there but didn’t really get to sight see! I also love the guardsmen egg cosies and keyring, would love to make those – so just about everything really! Lovely book, would love to win it. I would love to make the guardsman egg cosie, as both my little sister and little girl love dippy eggs. They would both be so happy to see the guardsman keeping their eggs warm and making sure their soldiers stay in line. I would love to make the Princess crown for my niece. She is very much a girlie girl and she would love it. I would love to make the little princess tiara for my granddaughter. She is 14 months old and I have not met her yet! She lives in South Africa but I am hoping to visit later this year when a little brother or sister is due to arrive in November! There are so many gorgeous patterns that I would love to try that I can barely contain myself. I love the hat. I could make a few of these for my daughter and her cousins (who being younger always want to wear “big girl” clothes to be like Amy. At least these would fit!! I love the flowered hat. I am a senior citizen and the hats with the balls on top are a little young for me. This is actually one of only a few crocheted hats that I like. would love to make a few for my family, too in different colors. Thank you. I would love to make the beautiful hat with all those gorgeous flowers on it! I would love to help my daughter make the skyline cushion. she loves to collect unusual cushions and has recently asked me to teach her to crochet after she watched me making items for our new grandson. I would make the flower beanie and I would make it for me. I donate so much which I love to do but it is time for me. I love skyscape pillow. Would be neat conversation and decorative piece. Do I have to pick just one? They are all so cute and fun I can’t decide which I like best! I make lots of gifts and the items pictured here would make wonderful gifts. I would make the pretty scarves for my mother and best friend; the pink bunting and a crown for my daughter who loves pretty girly things.Have to make a crown and the adorable owl hat for my niece. My son would adore the guardsman ornament and the London skyline pillow and instead of making just one ornament I would have to make at least 20 so he could pretend his soldiers were fighting a battle. I love to make mittens and hats for charity and try to make them pretty so the recipient feels special so the striped mittens and the pretty hat with flowers would be perfect! I’ve never been to London but I’ve always thought the double decker buses were so cool… I’d absolutely have to make the bus ornament for me. I know I would get a lot of fun out of making these patterns and I’m sure the recipients will love them too. I love all of them but would LOVE to make the hat for myself and the toy soldiers for our lovely grandsons. I’ve only recently started crochet again after a break of many years and I’m absolutely loving it! Sky line cushion just pips the post for me. I would love to make this as it would look fab in my living room. That beanie! It’s just absolutely gorgeous and looks incredibly warm! I just started crocheting a month ago and I just love making flowers so the beanie would definitely be my choice! I come from London and moved North with my job about 10 years ago. I miss the sight, sounds and the buzz of London (and the Pie n Mash shops lol) I would make the cushion to remind me. I used to be able to see Canary Wharf from my flat which was finished the year my daughter was born so I might even add a canary wharf silhouette to the back. Id love to make the egg cosie! Boiled Eggs with soldiers is my sons fav food! I would make the guardsman and perhaps turn him into a key fob as well as an egg cosy. Given that we have just celebrated HRH the Queen’s birthday this is both topical and fun and would be such a great gift for friends & family no longer in London or the UK. Would then make the skyline cushion as I can think of at least a couple of people who would LOVE this. Afterwards would probably make a hat (or two!) and perhaps some mittens to match; the bunting is also cute. Then would browse rest of the book and pick out more giftable ideas (remembering to gift to myself once in a while). Of course – all this creativity could mean I might have to buy more yarn……. I would love to crochet the flowery hat, just looking at it makes me smile so being able to wear it would be the icing on the cake! I am new to crochet and absolutely love it, it is my favourite way to spend time now. I would love to make the crown cushion because we had a street party here to celebrate the queen’s birthday, that I couldn’t go to as i couldn’t get out of my house in a wheelchair, so i spent the day watching it all from my window. I love the crochet tiaras. I have 2 princesses who would love to add these to their dressing up boxes and it would be a perfect project to do with my oldest. She’s 8 and has just started crocheting. I love the tiaras. I have 2 princesses who would love these in their dressing up box. It would also be a great project for my 8 year old who has just started crocheting. For me I love the skyline cushion cover- as someone who still commutes, it reminds me how much there is to see in London. I would really love to make the London skyline for a friend who is British and missed home and one for myself too to remind myself of all the good times I had when I was there. I would love to make the finger-less gloves because I have a circulation problem and these will help keep my hands warm. I’d love to make the pillow! It is so cute! The crowns are so sweet. My granddaughters will look so regal in these. I can’t wait to get started!! It’s hard to choose one pattern, but I would love to make the guardsmen soldiers, both the egg warmers and the ornament, and then I think things for my new grandson, or that hat with the flowers for myself, then I think two crowns, one for my step granddaughter and one for me, then we have a new game. I think I’ll start with the soldiers ! So glad I stumbled upon this! That skyline line pillow is beautiful! Just added the book to my shopping cart! Love all the patterns but would choose to make the hat because it is so pretty and I haven’t crocheted a hat before . I love the pillow of London. I live in Las Vegas and we also have the large ferris wheel. I would love to learn how how to make the entire project so I could make a Vegas themed pillow to send to my friends from UK and AU. I would keep the London pillow and keep it with my London gifts from them! Love it! I would love to make the princes tiara for my five granddaughters. I’ve made them many things but this would be their favorite. Love all the patterns in this blog, my favourite would be to try and make the tiara head bands. As my god daughter loves a tiara. There are definitely too many cute things to choose from but I would have to make the tiara as my husband always calls me Queen Anne, ha ha. The flower hat would also be beautiful and I can picture it in several different color options. I would love to make the flowered hat for my 2 granddaughters and then make the mits to match. They think that things made by their nana are really special. I’ve only managed granny square blanket so fat. I would LOVE LOVE LOVE to make the London skyline pillow for my daughter!! She is totally in love with London! !